Thinking of building a new house? 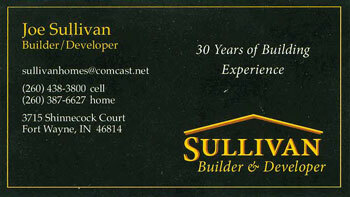 See the "People's Choice" award winning design and new construction by Sullivan New Homes. Long known as one of Fort Wayne's premium home builders now has 3 new homes in the Hamlets of Woodland Ridge West in SW Fort Wayne. Take a look at Fort-Wayne-Homes.com. Call 811 before you dig. Get your utility lines marked before digging. Digging into electric, gas and cable lines can be dangerous and expensive. Huntington, Indiana is located approximately 20 miles southwest of Fort Wayne, Indiana on Highway US24. Huntington is NE Indiana's second largest city, after Fort Wayne. It is the home of Huntington University, the Dan Quayle Vice President's Museum and the Forks of the Wabash River. Huntington, Indiana is a great place to live and work, along with a good school system, low cost housing and an award winning Huntington Hospital associated with Parkview Hospital in Fort Wayne. Visit Huntington and see why Huntington is such a great part of Indiana. See information on Well Water Filters and Replacement Water Filters. Advertising services by Kevin Anderson at the Anderson Agency Advertising.